Only two days have you booked? Hi everybody! Dutch psychedelic rock band DeWolff score with 'Once In A Blue Moon' their first #1 smash. One of the great tracks of their album "Thrust". Chris Bevington Organisation's 'Cut and Run' jumps to #2 and Eric Gales and Beth Hart's 'With A Little Help Of My Friends' remains at number three. The Chemical Brothers are back in the top 10, new is Jon Anderson's 'Ramalama'. After all our posts this week it will be no surprise that Roof Down's "Lost" is ALBUM OF THE WEEK. The four Swedes Johan Sjöberg (vocals), Mats Stille (guitar), Thobbe "TheHip" Hermansen (bass) and Staffan Westelius on drums create a unique style of alternative rock: Seattle rock inspired post grunge. Their music has it’s roots in grunge rock but at the same time it rockets away to a modern 90’s rock-based barrage! Here you should definitely listen to if you like bands such as Alice In Chains, Pearl Jam and Soundgarden. We hope we can see and hear this band live soon. Of world class!! 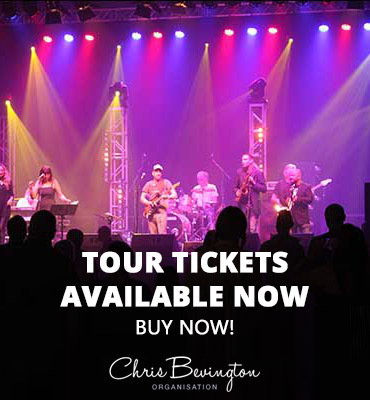 Chrisbevingtonmusic is at Nantwich Jazz, Blues & Music Festival.